Jedd O'Keefe at Highbeck Lodge in Leyburn, Yorkshire and Tom Dascombe at Manor House Stables in Malpas, Cheshire are the winners of the Lycetts Team Champion Award 2019, which celebrates the British racehorse training yards with the highest standards of employee management. The winning yards were also awarded a £4,000 prize for each yard to benefit and support their teams. Applications for the 2020 Lycetts Team Champion Award (LTCA) will open in September 2019 - scroll down this page for Further Team Champion Award News and follow NTFmuse to receive the news bulletins. To apply for the 2020 LTCA - first register your intention to nominate by sending an email to teamchampion@racehorsetrainers.org You will receive a confirmation email to assure you that you are part of the LTCA 2020 and answers to any questions including, how to complete the Nomination Form and prepare supporting evidence. The 2020 Nomination Form will appear in September 2019 below. .
To give you an idea of what you need to do, read the section below about the Winning Approach which underpins the award and is the standard to which we hope all trainers will aspire. The assessment criteria for Lycetts Team Champion Award are based on The Winning Approach, a best practice standard developed for the NTF by consultants Sport and Beyond. They include effective recruitment and induction systems, a safe and positive working environment, developing staff to fulfil their potential, and rewarding achievement. A copy of The Winning Approach can be found on the NTF website using the link below. Team Champion emphasises the actions that are most closely aligned with strengthening the team ethos. Development of The Winning Approach and the award was funded with the help of The Racing Foundation. Yogi Breisner, renowned for his stellar accomplishments as a competitor and leader in the field of Three Day Eventing, chaired the panel and presented the prizes for 2019. 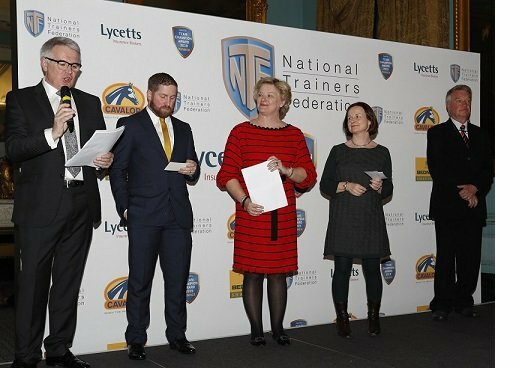 Commenting on the judges' experience of the awards and the assessment, Breisner said, "It has been a very interesting exercise to be one of the judges and a privilege to be involved in a fantastic initiative by Lycetts and the NTF". Yogi Breisner went on to say, "I have been very impressed at the high standard of the applicants and it has shown that in many yards there is a very high level of work etiquette and team spirit." Rupert Arnold, Chief Executive of the NTF, said, "I am delighted at how enthusiastically trainers and their staff have responded to this new award. By participating, they have opened their businesses to scrutiny by knowledgeable professionals and demonstrated that British racehorse trainers offer great places to work. We have established a strong base from which to build the award for the future. I know other trainers are already keen to follow their colleagues' example next year and we have acquired a bundle of knowledge and lessons to share with them." We congratulate the teams which achieved a star rating based on the judges' scoring of their nomination form. The star rating is awarded in recognition of the high standard of their employment practices. One star - this status is awarded to Yards with good team ethos and showing promising signs for the future. Two stars - this status is awarded to Yards that have shown very good levels of team ethos and staff engagement. Three stars -this status is awarded to Yards that have shown excellent levels of team ethos and staff engagement. 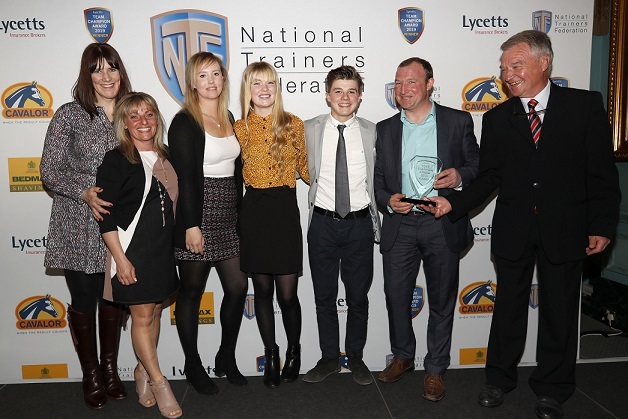 In early 2017, Rupert Arnold proposed the initiative for the National Trainers Federation (NTF) to create a Team Champion Award. 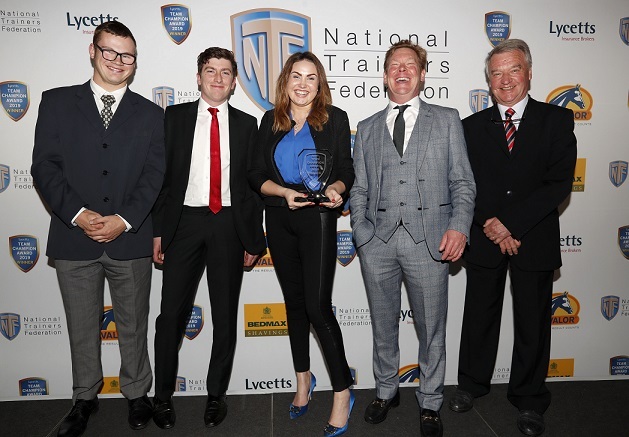 With a successful application to The Racing Foundation who awarded the NTF a grant and sponsorship from Lycetts Insurance Brokers, the Lycetts Team Champion was born. Improve recruitment and retention rates by promoting the most successful management practices and encouraging their wider adoption among racehorse trainers. The latest news on the Team Champion Award from our blogs pages. The Lycetts Group was founded in 1961 and has grown to become one of the UK's leading independently-operated insurance brokers. Lycetts specialises in farm and estate insurance and provides bespoke financial services, commercial and bloodstock insurance advice. It has 17 offices in the UK, with its headquarters based in Newcastle-upon-Tyne. Visit the Lycetts Group website. The Racing Foundation was established in January 2012 to oversee the distribution of funds to charitable causes within racing following the sale of the Tote. It is registered with the Charity Commission as a charity (no. 1145297). Since inception, the Racing Foundation has granted just over £7.6million to charities associated with the horseracing and thoroughbred breeding industry in Britain, supporting work in social welfare, education, training and participation, horse welfare, equine science research, and heritage and culture. Visit the Racing Foundation website.